Blue Cross Blue Shield of Texas will be the sole player in the ACA marketplace here, making Tarrant County the largest metro area in the state down to one participant. Four of the previous insurers in the county — Aetna, Scott & White, Cigna and UnitedHealth — each confirmed they have pulled out of the ACA marketplace throughout the state. ...Cigna also will continue to offer individual plans off the marketplace, according to spokesman Joe Mondy. A week or so ago, the Washington Insurance Commissioner announced that the weighted average rate hike for 46 plans certified by the state insurance dept. regulators is 13.1%. However, there was a major caveat: There were another 52 plans which still had to be certified by the board. Without knowing the average rate hike for the other half of the plans, there's no way of knowing what the final approved average increase will be. In addition, I also don't know what the relative market share of any of the plans (certified vs. uncertified) is, so there's no way of weighting the average across the full market. For all I know, 90% of enrollees might be among the first 46 (in which case any variances mong the other 52 plans would barely move the needle). Alternately, 90% could be among the missing 52 plans, or anywhere in between. Statewide weighted average rate increase is less than 6 percent. Blue Shield of California expands to Full PPO network statewide. Kaiser Permanente moves into Santa Cruz County. SACRAMENTO, Calif. — Covered California announced today the rates and expansion plans for its small group health insurance exchange, Covered California for Small Business. The statewide weighted average rate increase is 5.9 percent, for employers and their employees beginning Jan. 1, 2017, which is down from the 7.2 percent increase in 2016. HELENA – Montana Commissioner of Securities and Insurance Monica Lindeen announced today that following an extensive rate review process, her office has found the rates filed for health insurance in the individual and small-group marketplaces by Health Care Services Corp. (doing business as Blue Cross Blue Shield of Montana) to be unreasonable. This is the first time that such a finding has been issued. Arizona: Well how do you like that?? Centene *expands* AZ exchange coverage! Read more about Arizona: Well how do you like that?? Centene *expands* AZ exchange coverage! Read more about Holy Crap. how much DOES an international financial services corporation equity researcher earn in a year, anyway? When I first ran the numbers for New Mexico back in May, the average requested rate hike for the indy market appeared to be about 24.9%. Since then, however, there have been three major changes: First, Presbyterian Health Plan decided to drop off the exchange (although they'll still be around off-exchange). Second, it looks like CHRISTUS bumped up their request from 12.3% to 15.78%; and third, Molina Healthcare, which had been requesting a refreshingly modest 3.8% hike, resubmitted their request at a much higher 24% average increase. Three of the 5 carriers had their final requests approved exactly as is by state regulators. CHRISTUS and Molina have yet to be approved, but based on a lengthy online conversation with someone very much in the know about the New Mexico health insurance market, I'm highly inclined to believe that both of their final asks will be approved as is as well. OLYMPIA, Wash. – The Office of the Insurance Commissioner (OIC) has approved 46 individual health plans from seven insurers who will offer them in the Exchange, Wahealthplanfinder (www.wahealthplanfinder.org), for sale in 2017. The Washington Health Benefit Exchange Board is scheduled to certify the approved insurers and their plans at its board meeting later today. Regence Blueshield also filed 21 plans for sale in the Exchange and Bridgespan filed 31 plans. Both companies’ filings and rates are still under review. They must be approved by the OIC before they can be considered for certification by the Exchange. The Connecticut average requested rate hike has jumped around a lot over the summer. It started out at roughly 21.3% back in June, then increased to 22.2% after the HealthyCT Co-Op announced they were closing up shop. Then, several of the carriers submitted revised rate hike requests, bumping the average up further to around 26.8%. Most Connecticut health insurance plans sold through individual and small group markets will undergo steep rate hikes next year, although in some cases, the prices will not go up by as much as carriers had sought. 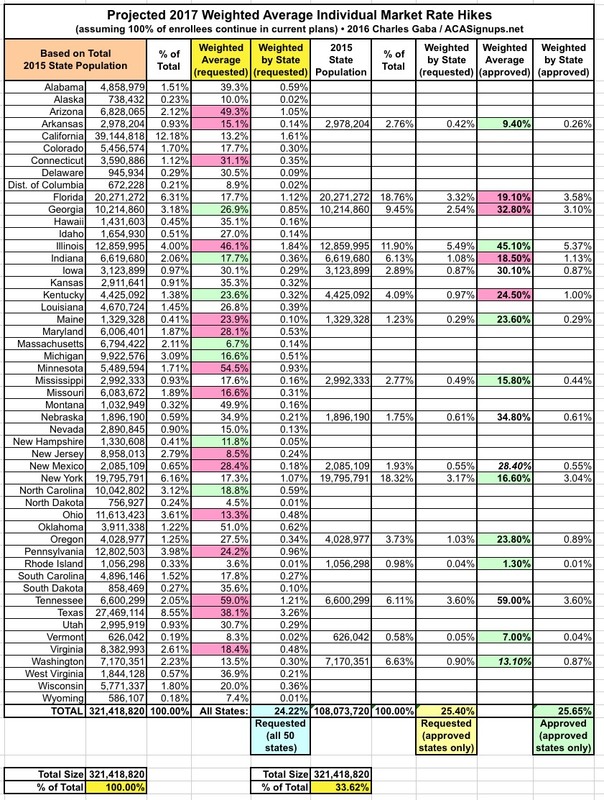 When I last crunched the numbers for the 2017 individual market in Arizona, the average requested rate hike statewide was a whopping 68%. However, that was before Aetna dropped their bombshell about dropping out of the exchanges in 11 states (AZ included), leaving about 6,400 residents receiving ACA tax credits in Pinal County with no subsidized policy options whatsoever. Since Aetna had intended on requesting a jaw-dropping 85.8% average rate hike if they had stuck around, this technically meant that the average requested hike for the other carriers would have dropped somewhat, although this would be limited by Aetna only having about 7% of the individual market in the state.